Forbes Middle East just announced Ms Doha Abdelkhaleq as one of the Middle East`s Most Influential Women 2018. 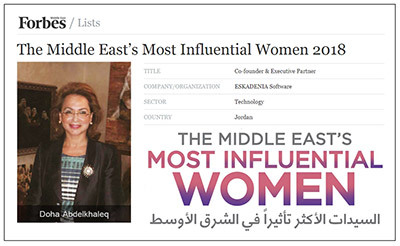 Co-founder and Managing partner of ESKADENIA Software, a leading company in software innovation based in Jordan, Doha Abdelkhaleq was recently featured as one of the women creating a positive impact for their countries and region. In the newest edition of Forbes Middle East 2018 magazine, they have published a list honouring 100 female figures for their significant role developing and enhancing quality of life in their respective communities. Ms Abdelkhaleq is honoured by the selection and grateful towards Forbes for the opportunity. “I was humbled by the news and aim to work even harder to have a more positive and focused impact on the development of our society and be a role model for females in our region,” she said. The co-founder of ESKADENIA Software, which was awarded one of the best 20 companies to work for in Jordan, is also the founder of Watan Music Chamber, a national initiative to assist the Ministry of Education to teach music in Jordan’s public schools. Ms Abdelkhaleq is also the chairwoman of Because I Care, an online digital sister-hood community. ESKADENIA was excited to hear the news and looks forward to more great achievements from their managing partner and other employees. Ms Doha Abdelkhaleq worked as the Regional Director for Legal Affairs at Ericsson Telecommunications before co-founding ESKADENIA Software in 2000. She was also a legal counsel in Beijing, Shanghai and Stockholm. In 2015, she was voted as one of 10 Most Powerful Women in Jordan and was on the board of trustees at the Crown Prince Foundation.